On Monday night, UFC president Dana White announced lightweight top contender Nate Diaz (Pictured) signed an extension to remain with the planet’s premier mixed martial arts promotion. “Just wrapped up another deal with @Natediaz209 and @cesargraciebjj,” White tweeted. As customary with UFC contracts, financial terms of the deal were not disclosed. However, the organization tends to ink their athletes to four-fight extensions. Diaz first emerged onto the Octagon scene as the winner of “The Ultimate Fighter 5.” After taking his first five big league bouts, the 27-year-old went through a rough patch by losing five of his next eight scraps. 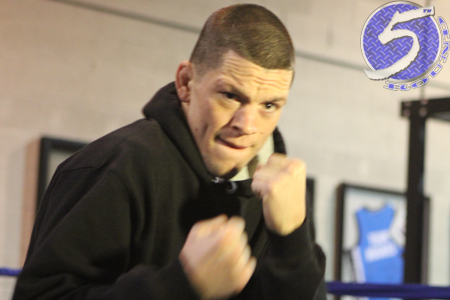 Since dropping back down to the lightweight class in September, Diaz has emerged a different fighter. Mr. 209 is perfect in his past three contests, with his last two coming against a couple of the division’s top tier contenders. White confirmed over the weekend that Diaz gets next dibs at the 155-pound crown. He will face the winner of Saturday’s UFC 150 rematch between current champ Benson Henderson and Frankie Edgar.